Eric Gales stands head and shoulders among other guitarists in his genre and is out to blow your mind and expand your musical horizons, in fact Joe Bonamassa calls him “One of the best if not the best guitarist in the world today”. He is known for mesmerising fans around the world with his uncanny connection to his guitar, don’t miss this legend make his Bluesfest debut. Bluesfest audiences are in for a thrill when Experience Jimi Hendrix takes the stage. Inspired by Jimi Hendrix’s unparalleled creative and musical influence Experience Jimi Hendrix brings together an all-star line-up of some of Australia’s guitar greats: Jak Housden – founder of the Badloves, Peter Northcote – who has played with Dragon, Tom Jones and Shania Twain, Dai Pritchard – Billy Thorpe’s right hand man who also plays with Rose Tattoo, Steve Edmonds – of Hoodoo Guru’s fame and Grant Walmsley –founder of the Screaming Jets. There isn’t an audience on the planet more fitting for this homage to the iconic artist’s songs, showmanship and trailblazing technique. Bluesfest is honoured to welcome Australian-based musician Jeff Lang back to the festival in 2017. He has earned worldwide acclaim as a virtuosic guitarist, a dynamic songwriter and a startlingly unique live performer. Blending rock, roots, folk, Blues, ballads, instrumentals, improvisation and a devastatingly high level of musicality, Jeff Lang is a singularly unique performer in our world. Ray Beadle has ripped it up at Bluesfest in the past, and he is welcomed back with open arms in 2017. Ray’s guitar and vocal styles evoke numerous Blues legends, whilst concocting a breathtaking style all of his own. It is not by chance that Ray has become a favourite amongst Australian Blues fans. 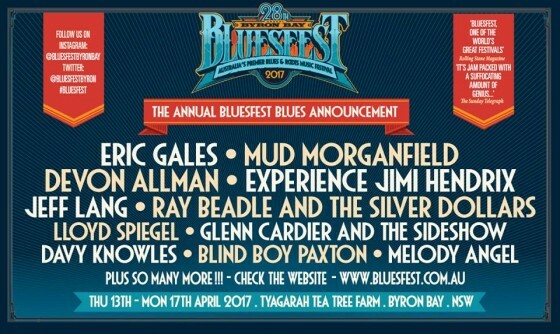 Bluesfest is proud to announce that one of Australia’s most highly lauded Bluesmen will make his festival debut in 2017. Lloyd Spiegel is an award winning solo artist on the cutting edge of the Blues scene in Australia. There is no doubt he will be at home on the Bluesfest stage. It was his triumphant performance at Bluesfest in 2014 that sparked the recording of Glenn Cardier’s highly acclaimed album Stranger Than Fiction, so it is with great excitement that the festival announces he will return with his band The Sideshow in 2017. After a successful career in the 70s, Glenn Cardier’s re-emergence has been nothing short of extraordinary. Onstage, there are the trademark flashes of dark humour in his songs of stark beauty and thumping rockabilly/Blues. All the way from the Isle of Man, Davy Knowles makes his Bluesfest debut in 2017. He is no stranger to festivals having played Coachella, Lollapalooza and Bonnaroo with his band Back Door Slam. You know you have someone special on your hands when Peter Frampton raves: “He’s definitely the gunslinger guitarist of the 21st century’’. He won the hearts of many Bluesfest goers in 2016, so it’s with great pleasure Bluesfest welcomes Blind Boy Paxton back in 2017. Paxton has earned a reputation for transporting audiences back to the 1920s and making them wish they could stay there for good. This young musician sings and plays banjo, guitar, piano, fiddle, harmonica, Cajun accordion, and the bones (percussion). She may be at the bottom of this announcement, but Melody Angel is destined to be at the top in the near future. She regularly performs at Buddy Guy’s nightclub Legends in Chicago, and has American Blues Scene exclaiming “Besides her playing, what makes Angelsuch a powerful performer, is her strongly impassioned vocals. We can’t wait to see her continue to grow. What a future she has! If you get a chance to catch Ms. Angel live, do it!” Melody Angel is an important voice and one that deserves to be heard around the world.